AirAsia named the World’s Best Low-Cost Airline for the tenth year in a row at the 2018 Skytrax World Airline Awards held in London. 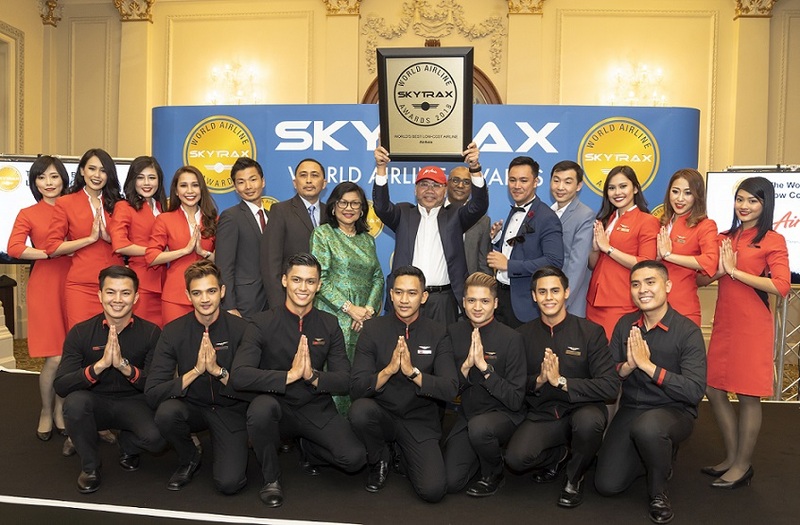 AirAsia co-founder, Executive Chairman of AirAsia Group Berhad and Group CEO of AirAsia X, Datuk Kamarudin Meranun accepted the award in London together with AirAsia’s long-serving Allstars from across the region. AirAsia X was also presented World’s Best Low-Cost Airline Premium Cabin for the sixth consecutive year. Chairman of AirAsia X Tan Sri Rafidah Aziz accepted the award for AirAsia X. As part of the celebration, AirAsia will be offering unbelievably low fares on 23 – 29 July on www.airasia.com and AirAsia mobile app. Guests also stand a chance to win one year of free flights* by participating in our #WeAreAllChampions social media contest. For more information, visit our Instagram (instagram.com/airasia) and Facebook (facebook.com/AirAsia).